The Psalms was the single most important Old Testament biblical book in a monastic community: psalms formed part of almost every service and mass, every day. It is therefore natural that the Psalms received special attention from medieval commentators, and several commentaries on the Psalms were written in the 12th century. This copy of a very rare text comes from the Benedictine abbey at Ramsey, about 10 miles north of Huntingdon in Cambridgeshire. 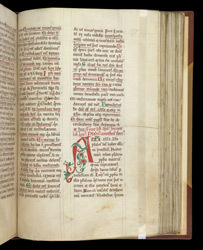 This enlarged initial 'A' marks the start of the commentary on Psalm 106, which is not one of the usual divisions of the Psalter. In this commentary the Psalms are divided into five books; the rubric states that this is the start of Book 5.